What do the numbers think about Tulane's recent offense? 5 games into their season, the Green Wave currently sit at 3-2 (1-1 in AAC play). Tulane has had really optimistic play leading many to project the Green Wave to be bowl-contenders. This looks to be a completely different team in year 2 under head coach Willie Fritz. But what has changed? I’ve attempted to take a more analytical approach to responding to this question, using advanced football statistics developed by Bill Connelly. A few things should be known by the reader before going into the bulk of this article. Explosiveness: This term has been nicknamed the “3-pointer of Football” because of how essential it is to a team’s success. Explosiveness is essentially a measure of a team’s ability to create big plays. A play is deemed “explosive” if it is a pass play of 16+ yards or a run play of 12+ yards. This definition is slightly different from what I used last year (last year I used 20+/10+ yards respectively); however, the yardages of 16+/12+ are more commonly used so I decided it was necessary to make the switch. On 1st down: the player gets 50% of the way to the 1st down marker/touchdown. On 2nd down: the player gets 75% of the way to the 1st down marker/touchdown. On 3rd/4th down: the player gets 100% of the way to the 1st down marker/touchdown. For example, if it is 1st & 10 and a player gets a 5 yard run, that is considered successful because he got 50% of the way to the next 1st down; however if it were 2nd and 7 and a player only got 3 yards that would not be successful because he only got roughly 43% of the way to the first down when he needed 75% for the play to be considered successful. With these definitions in mind, we can now get into breaking down the statistics behind various position groups for the Green Wave. I figure it’s only fitting to start with the most important position on the field, the Quarterback. It is not coincidental that the Green Wave’s improved play can largely be attributed to a huge improvement at the Quarterback position: specifically coming from Jonathan Banks. One common mistake that is made when people talk about the success of Banks is they will almost always talk about his running ability. 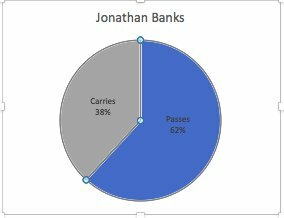 While I am a huge fan of Banks’ ability as a runner, it is his versatility and ability to pass the ball that has really given the Green Wave a dual-threat that is hard for opponents to handle. 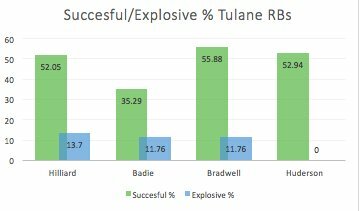 Last year, the Green Wave offense had to rely on its option running attack for the bulk of its offense; and if opposing defenses ever got the hang of it, it put Tulane in a huge rut, unable to get out of stagnant play. Banks gives Coach Fritz the ability to get out of this monotonous offense and move more to a balanced attack. 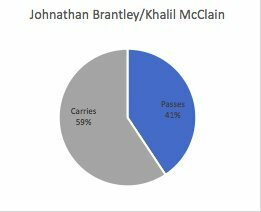 Take a look at the distribution between pass-attempts/rushes for Banks as opposed to the pass-attempts/rushes for the other Tulane quarterbacks who have gotten snaps this year. 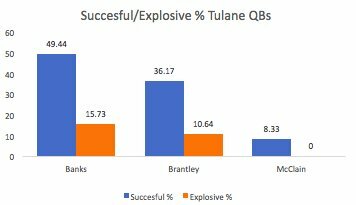 To give you an idea of just how good these numbers are for Banks, the Tulane offense as a whole last year had an average explosive % of 10.75% and an average success % of 36%. Banks is absolutely blowing these numbers out of the water, and it has definitely shown in a much improved Green Wave offense. Quite arguably both the best and most deep position group on the entire Tulane team, the Running Back core that the Green Wave use is one of the top in the nation. At 293.0 yards a game, the Tulane rushing attack is currently ranked 9th in the nation, in large-part due to the running backs. As one can see, Hilliard leads the way in explosive % and is one of the leaders in success; however, the balance across the board is what’s most shocking. 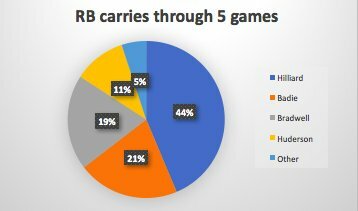 This Tulane rushing attack is extremely unique in its consistency and depth at the RB position, that is unmatched virtually anywhere else in the NCAA. The final position group I wanted to look into is the wide receiver position. It should be noted that the explosive % numbers for wide receivers is naturally a little skewed by the fact that it is easier for a WR to make a big play, on average, than it is for a QB or RB. 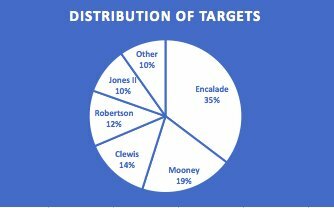 It should also be noted that I have included Tight Ends in this group, but the only reason I have done so is TE Charles Jones II gets enough targets/receptions that he can be considered a “receiver” in some sense. This Green Wave team is a much-improved team from last year, and it is definitely reflected by advanced analytics. ESPN’s FPI currently favors the Green Wave in 3 of their remaining games and gives Tulane a greater than 35% of winning 3 more. Also gives the Green Wave a 0.2% chance of winning out and a 0.8% chance of winning the AAC (hey a guy can dream, right?). Fritz has this ship headed in the right direction, get excited and #StayAngry Greenies.